Pool cleaning Palm Springs residents’ numerous pools, both residential and business-owned, is a unique challenge due to the city’s strange weather. Regardless of the time of the year, it’s going to be summer-like weather in Palm Springs. That means swimming pools are ideal all year-round, but it also means that these swimming pools are constantly battered by dust, dirt, debris, and brutal sunlight that severely reduce the lifespan of chlorine in the pool. All of these mean that pool cleaning Palm Springs residents’ pools happens more in the city than in other cities in the country. If you are in the area and want to get your pool professional cleaned, you first need to consider a few things. The really reputable pool cleaning companies in Palm Springs are legitimate businesses with more than one pool cleaner on hand. This may seem discriminatory, but if you want the best service, you should be wary of a pool cleaning company that only has one employee. They won’t be able to sustain a business with just one pool cleaner unless they’re cutting out on important things. Either that or they’re not interested in providing a decent job. Think of it this way, if you want to go with a small pool cleaning company that only has one staff because you think you’ll save money, then you may as well just hire your neighbor’s kid and you’ll save even more money. 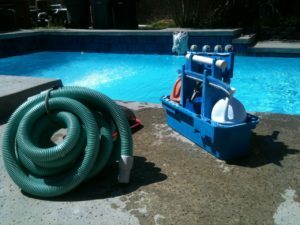 Find out what a proper pool cleaning service entails. When you hire a pool cleaning company, you are giving them access to your private property. So it is important that you check whether they can be trusted. Make an effort to check their background, and put in a lot of effort in communicating with their customer support staff. It is easily one of the best ways to check if the company is legitimately pleasant to work with. A good cleaning company will have courteous and accommodating customer support, whether in person, on the phone, or through email. On the other hand, a company with a rude support staff should be avoided at all costs, even more so if they don’t have a support staff at all. We at CV Pools know that different pool owners have different needs and budgets. So we allow for some leeway and will meet clients halfway – whether its through discounts or providing extras in the service, we are always ready to give you the best pool cleaning service in the Palm Springs area. Contact us now if you have a pool that needs cleaning.